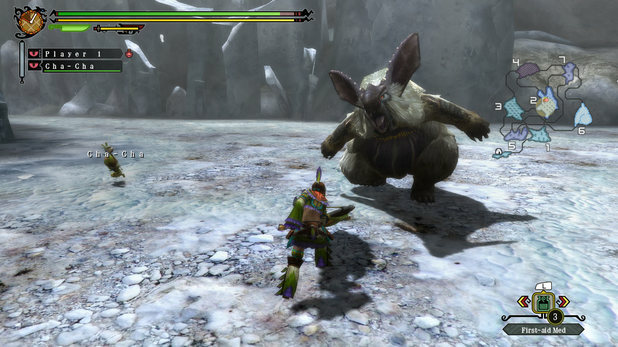 Monster Hunter 3 Ultimate is not just a simple port of the Wii version’s Tri, but a more rounded Monster Hunting experience. 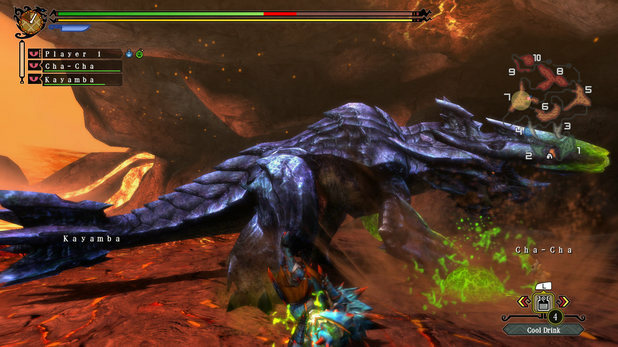 Monster Hunter 3 Ultimate comes from a long line of very successful predecessors. Maybe not so much here in the West, but in Japan, it’s something of a big deal. The game is a tried and tested blend of hunting, gathering and cats. Yes, cats. With over 300 multiplayer and single player missions, there is plenty to keep you going. 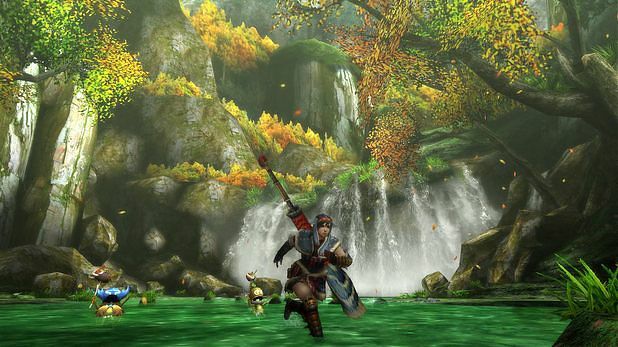 But what makes Monster Hunter 3 Ultimate any different from any other MH game in the series? Well, not a lot to be honest, but it’s thoroughly enjoyable. So, the solo story is a little bland, the main village of the game is experiencing earthquakes and the like, and it is up to you to slay the mighty Lagiacrus that is plaguing the land, but only after you’ve hacked and slashed your way through countless other beasties to make the armour and weapons you need to kill it. Which brings me to my first point: there are tonnes of weapons and armour for you to forge and upgrade. 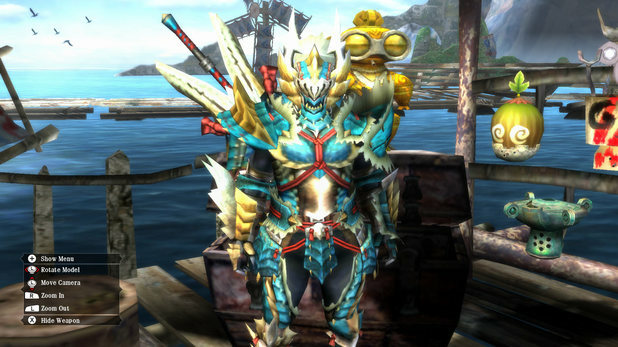 Each armour set has it’s own look, taking the form of the monster it is mainly made from, I have a thing for blue, so my hunter is currently clothed from head to toe in the armour set of the previous mentioned Lagiacrus, complete with a blade to match. There are 12 weapon categories to choose from, from the slow, but powerful great sword, to the weaker but nimble sword and shield. And for those who like to take down monsters from afar, you’ve got your bows. The game gives you a weapon of each type to start with, so it’s always worth testing them all out to see which suits your play style best. Weapons and armour can be forged and upgraded using parts from the monster you encounter, when defeated you can carve the beasts to obtain materials which can be transformed into bigger and better monster slaying tools. It’s worth noting though, that sometimes this can be frustrating, some weapons require rare materials, which can be hard to obtain, meaning you will often need to undertake the same mission multiple times to get what you need, I’ve had to kill over 8 Lagiacrus just to get my matching set. That being said, totally worth it! So, to get these tools of the trade, you might expect there to be a few monsters. The designs are fantastic, down to each detail, like the flints of the Qurupeco, or the scales on a Diablos. Each monster has been made to seem lifelike, not just with its looks, but its behaviour, the animations are so fluid, it’s easy to believe that these could be real creatures and that the developers have studied them in the wild to get their unique mannerisms perfect. Of course, they are in the wild, their own habitats that the game designers have brought to life. 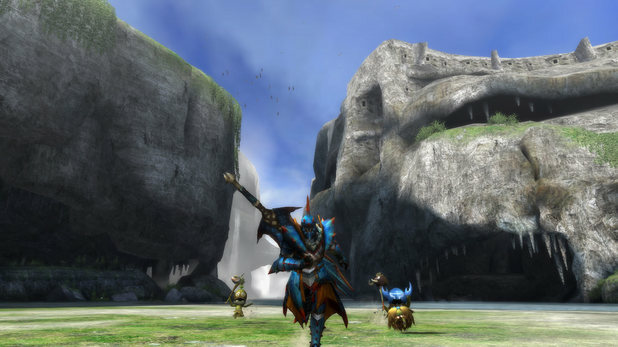 There are many areas in MH3U to hunt in, you have the humid, swampy forest, the harsh heat of the desert area, the unforgiving plains of the icy tundra, and the impossible mountain passes of the volcano. Certain monsters can only be hunted in certain areas, meaning you will need to equip your self, cold drinks for the volcano and desserts to help keep your temperature down, and hot drinks to keep you thawed out in the tundra. 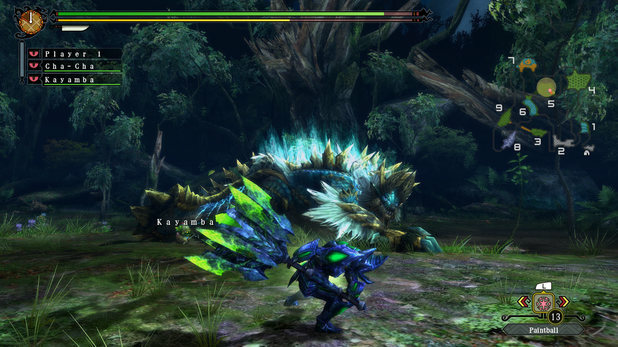 Game mechanics like this add to the fun, and challenge of the game, making you always prepare yourself before a hunt, the elements can weaken you before you even get a chance to face off against your quest piece. I found that the touchscreen addition was a great help, allowing you to easily access combinations on the fly, as well as choosing your items in the heat of battle. The 3DS makes up for it’s lack of second analogue stick by providing one on the touch screen as well, though, previous games in the serious have not suffered from this lack of second control input. This being said, the 3D function of the game is an obvious add-on. You can see the game is not made for 3D originally, and thus, I normally play with it off, I don’t feel it adds to the experience, if anything, it makes the monster feel a little less real. Something that has been added to this version of the game, is the new lock on feature, which is not present in other versions of the game. 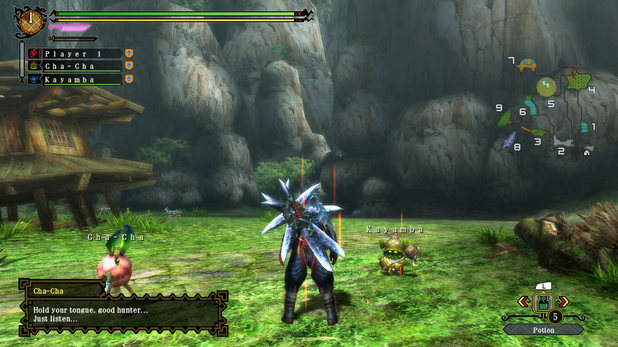 When fighting a larger monster, an icon of it will appear on the bottom screen, by selecting it, you will look onto the monster, so whenever you need to face it in a hurry, you simply press the left shoulder button to centre it on your screen. This small addition is a godsend, especially in the underwater levels, which without it, I can imagine would be near impossible. A major let down of this title, however, is the lack of online play. Yes, it has the local player, but it needs online to be that much better. The local play is great when playing with friends, and yes, you can still access the “online” missions offline, but to truly get everything from this game, you need to play it with others. Capcom recently patched the game to play online for users who own a Wii U, but still, it’s not the same. 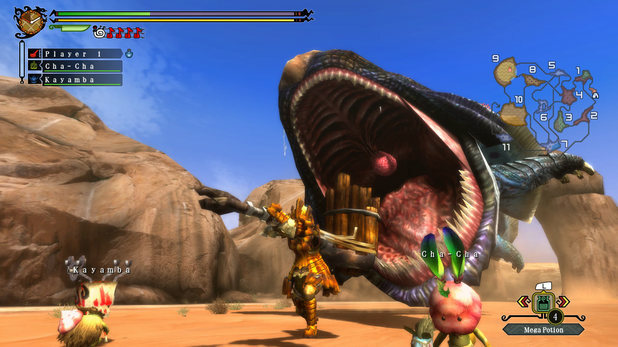 Overall Monster Hunter 3 Ultimate is a great game, it’s a must-have addition to your 3DS library. It packs in hours of gameplay into such a tiny cartridge (I’m currently at 45 hours and I am only Hunter Rank 3) as well as amazing visuals for the handheld. Gameplay hasn’t been compromised by the lack of second analogue stick, and if you really need one, you can always use the circle pad pro. It can be a little repetitive at times, but with friends, this can easily overcome. The lack of online is a disappointment but not something that should deter you from buying it, especially if you have like-minded hunters close by. A great game that is worth adding to your collection! 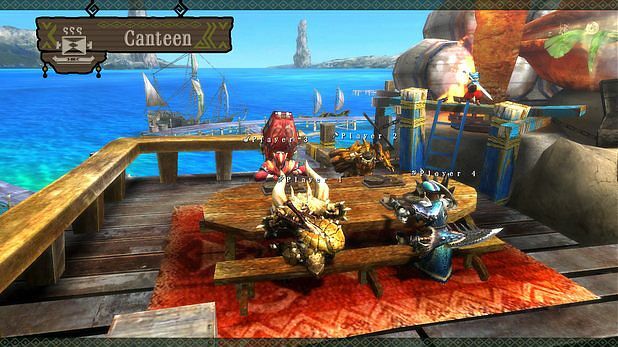 This review is based on playing the Nintendo 3DS version of Monster Hunter 3 Ultimate .